Living The Life: Best Face from 2012″ I Heart Faces Photo Challenge! Best Face from 2012″ I Heart Faces Photo Challenge! What I can say it has been a very long time since I have posted anything. I took this photo last year of my daughter wearing my wedding dress. I thought this was an amazing idea. Of course I cannot take the credit for the idea, I saw the photo on Pinterest. I hope to share this photo on my daughter's wedding day with her. I know she has a long time before that happens but one day she will get married and I think this photo will be a great keepsake to share again with her on that day. Today is the last day you can enter. There are so many beautiful photos. I happy I am not the judge in this competition. Your daughter is beautiful. 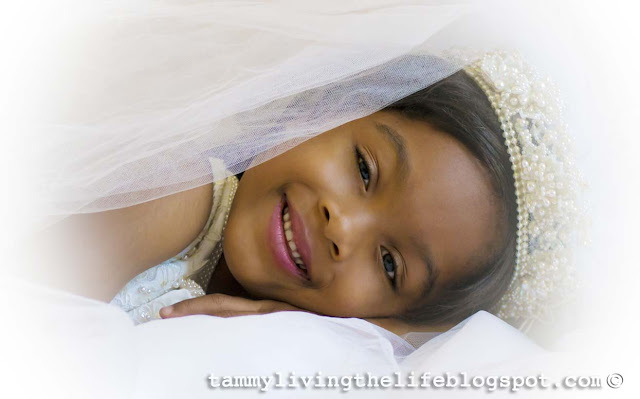 My friend Mary takes a picture of her daughter in her wedding dress every year on the little girl's birthday. Isn't that the cutest idea? My friend is so creative. This is so sweet! I'm thinking it might be fun to do this with my daughter. I love that you'll be able to share this on her wedding day someday.